Everyone in Southern California would like to have one — a water wise garden that looks great and is environmentally friendly. Since 1987, SNYDER & ASSOCIATES’ expert team of designers and builders has been creating and installing beautiful landscapes. In recent years, the challenge of sustaining beauty with less water has changed the game. Southern California looks like it has water to spare, because we have lots of swimming pools, gorgeous lawns and bountiful trees and flowers, but in truth, we live in a desert, and we’re experiencing a drought that might last for years. How much water can be saved with a water-friendly garden? According to the U.S. Environmental Protection Agency (EPA), the average American household uses 320 gallons of water per day, about 30 percent of which is devoted to outdoor use. In addition, some experts say that as much as 50 percent of water used for irrigation is wasted due to evaporation, wind, or runoff caused by inefficient irrigation methods and systems. By the numbers above, an average American household can save up to 48 gallons per day or 17, 520 gallons of water per year! It’s usually not necessary to water grass every day. At Snyder & Associates, we can help you further your water savings by using regionally appropriate plants. We can design and install an irrigation system to create a water–smart, beautiful and efficient landscape to achieve the curb appeal you desire. Once established, native plants require little water beyond normal rainfall. How much you save depends on how the yard is designed and how carefully the plants and irrigation systems are thought out, planned and installed. While we have our own team of excellent landscape designers, we often work with other landscape architects here in Southern California. The Yunker/ Vandenburgh yard (featured above) was the GRAND PRIZE winner in the 2010 Roger’s Gardens California Friendly Garden contest, and division winner for Best Water Efficiency. SNYDER & ASSOCIATES constructed the project. 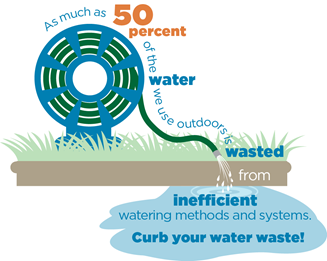 To reduce runoff and maximize water efficiency, water friendly landscapes use drip irrigation. Some controllers are offered with an attached rain sensor that automatically turns off the irrigation for 24 hours when it senses rain. Mulch (1 to 2 inches) and worm castings can be applied. These help retain the water, keep down the weeds, and enrich the soil as it naturally decomposes. Turf grass and lawns will not usually look good in our dry climate unless plenty of water and fertilizer is applied. They also require regular mowing, which can create green waste that needs to be transported to landfills. 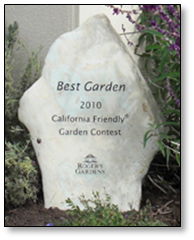 Water wise gardens create food and habitat for beneficial insects, birds, and butterflies. Plants that are adapted to our Mediterranean climate rarely require fertilizers and pesticides. Commonly, over irrigation carries synthetic chemicals in the runoff, which ultimately ends up in our water and ocean environment. SNYDER & ASSOCIATES invites you to enjoy a beautiful, water-wise, sustainable landscape. We’re a licensed, insured, award-winning company that has helped our clients enjoy their outdoors for over 25 years. Let us know how we can help you achieve your dreams.